I’ve had as a New Year’s resolution to run a 5K for 5ish years now. Every January I decide this is the year it will happen. And every year, I run once or twice and stop. I get too busy. It’s too cold. I have a myriad of excuses. This year is a little different. I started running last summer. I live in a state that allows me to run outdoors for all but a few weeks (days if you are really hard-core, I’m not) of the year. I ran at least 3 times a week all summer long. For my birthday, I received proper running shoes. During Christmas break, during one of my runs, I decided to run a 5K. In late February. By the time I got back home, I had forgotten. This last week, I finally sat down and found a run. Not a race. 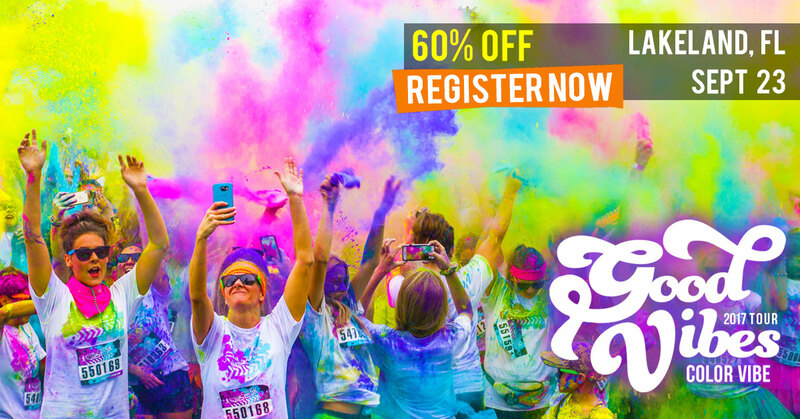 On 21 February, I will be running/walking in the Color Vibe run in Lakeland. You are all welcome to come and throw colored powder at me while I attempt this feat. Click on either photo to get to more information. Anyone have any suggestions or words of advice, I’d greatly appreciate it. I wish these photos were mine, but in fact are property of Color Vibe. Clicking on them will link to Color Vibe’s facebook page.